Wyke Green is a par 69 6,000 yards (yellow tees) parkland course. It is a mere 200 extra yards from the white tees. The course is located in Isleworth London, within sight if not sound of the Heathrow Airport flightpath and is partly bordered by Network Rail tracks, an oasis in the metropolis. The course comprises 4 par 3s, 13 par 4s and only 1 par 5. The 219 yard par 3 16th is a particularly difficult challenge for someone who doesn't hit my driver more than a 200 yard carry. By contrast the 112 yard par 3 17th is also a tricky challenge to find the green because of its elevation and its surround by bunkers. There are 7 par 4s which are in excess of 400 yards each, most notably the 445 yard 15th and 419 yard 6th, indexes 2 & 1 respectively. The preponderance of so many 400+ yard holes on the card made the task of course management in order to bring in a respectable score essential; something I failed to do first time out. The course was in excellent condition, fairways, greens, bunkers and tee-boxes. The course is a fairly gentle walk, much to my liking; however the challenges arise out of the positioning of the fairway bunkers, always seemed to be in play for me, the doglegs and in particular the numberous tough green side bunkers. The greens were generally larger than they appeared from the fairways/rough, were very undulating and tricky to read. 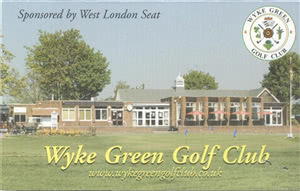 I played the course as a guest of fellow TSGer Brigitte Lockwood and her husband Peter, a proud member at Wyke Green. There is a good ambience about the club, from staff but also a few members gathering to go out on their Monday roll-up before we were due to tee-off. One member had not only heard of Cherry Lodge but had also played it a few years previously, before all of the recent course changes. Arriving early for our tee time intending to have breakfast before we played, I found that the clubhouse kitchen service is closed on Monday's. Facing the prospect of a short drive back the road to the nearby Tesco's store to get something to eat/take out on the course; my mood was pleasantly altered by the fact that a club member advised me that there was a halfway house located a few minutes walk away; which I hastily visited and enjoyed. Weekday (Mon to Thurs) green fees are £40, or £20 as a members guest. The County Card discount scheme is also accepted. I look forward to getting another opportunity to play the course again and to apply my newly found playing knowledge to make a better attempt at playing to handicap, if not better. While I won't go as far as to say that it is a 'must play' course, I nevertheless consider it to be a quality course and that fellow TSGers would also enjoy it and would need to be playing their best golf to post a good score. Excellent condition at the moment. Green are superbly fast and have totally recovered from their fusarium attack last winter thanks to the hard work and skill from the Greenkeeper. Friendly members & staff in Clubhouse, very helpful Proshop, I was offered the use of a free buggy to go to the half way hut, as it a must: Karen's kitchen is not to be missed....I had a huge rock/muffin type cake with a cup of tea whilst watching players teeing off from the 8th & 9th holes. The practice putting green and chipping area in front of the Clubhouse are a pleasure to practice on and reflect the quality that you will find on the course. Lovely new wooden tables (perfectly installed by Mr L. who won his Matchplay today against last year s 'champion) outside on the terrace overlooking the practice area. Junior groups been actively encouraged to play the game. A very pleasant afternoon as a Visitor but cannot wait to play the course again. Great course very well kept, with some interesting holes. Good half way house and club house. Very friendly staff.Great practice areas, will play again. Thanks for deal Brigitte. Absolute pleasure for short game fans, the Greens are sooooooo good, who wants a "gimme" when all the putts fall in, but one needs flair & feel as you could be very surprised by all the very subtle breaks, undulations. The course itself was in fantastic condition from tee boxes (impeccable) to fairways, first cut, fringes etc....those pitches and chips reaching the greens as one expect them to. Well done to the Greenkeeper and his staff. The 1/2 way hut is very pleasant and the tea served in a colourful mug is only 50p and tastes good. So do the sandwiches. Karen has all under control and always smiles. Opens every day. Friendly staff all around and very pleasant members. I do hope that Mr L. will invite me more often now that he has more time on his hand. Today he kindly managed to organise a Guest rate for my Foxhills golf buddy and I. We certainly enjoyed the experience and cannot wait to return. We were blessed with super weather and the course looked absolutely resplendiscent. A must play if in West London. An urban gem, sparkling under the winter sun......clearly back on the map! The previous review by Chris W. certainly gives a true picture of this Members Club. I played the course on Mon. 29th Dec 2014 (another rare invite from Mr L. (well Peter to TSGers), I really enjoyed the course on a glorious sunny winter day. The conditions were superb despite the heavy frost, greens in A1 condition, the fairways immaculate, a lot of undergrowth had been cleared too, speeding up the time it takes to spot errand balls. Very well done to the Greenkeeper. The 1/2 way hut was opened, a large cup of tea only cost .50p @ a members' club. It was definitely my lucky day as I managed to sell my LH 2nd hand Ladies golf club to Rosie F. (yes another Leftie), a young, keen, new golfer whose mother manages the refreshments hut! Now I can buy the one missing club in my bag: a Callaway 22 deg. hybrid...... Youpie or yepee..... Don't know the spelling . Will return to this lovely parkland course in Spring/Summer taking advantage of the new "Special Discount Card", Mond-Thursd, 5 rounds of 18 holes for £120. Excellent value and only 2.6 miles from my home!!!!! The new golf Manager Tim O. seems like a great enterprising addition to the Management Team. (hope you will read the 2 recent TSG reviews).